Osteoarthritis is a challenge for anyone who experiences the daily stiffness and pain associated with it. I am very aware of this since as I am aging it seems that yearly some new joint in my body receives an unwanted visit from "arthur". The traditional treatments for osteoarthritis are taking anti-inflammatory medications (NSAID -non-steroidal anti-inflammatory drug) and remaining as active as possible. Those two options present problems for many people since NSAIDs can have some significant gastrointestinal effects (stomach upset and worse intestinal bleeding) and due to the pain people are reluctant to exercise on a regular basis. 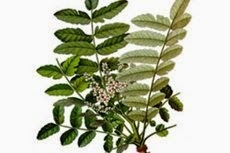 For me since NSAIDs tend to make my tummy unhappy, I am revisiting an alternative therapy recommended to me several years ago by my chiropractor Dr. Salzman - using Boswellia serrata (Indian frankincense). Indian frankincense, a herb with anti-inflammatory properties, has been used in the Middle East for thousands of years for medicinal purposes. Scientific studies have confirmed that after seven days of use people have reported decrease in their pain and more mobility. There also has been no reported major negative effects from long term use. To read more on the benefits of frankincense as an alternative therapy for osteoarthritis read "Herbal Arthritis Remedies: Using Frankincense Can Help Diminish Pain"
Hope to hear back on your experience with this herb. Live Well!